A combination of minutes clocked up and a knock sustained against Ulster could see the Irish centre miss out. Aki dejected after Connacht's loss to Leinster last month. 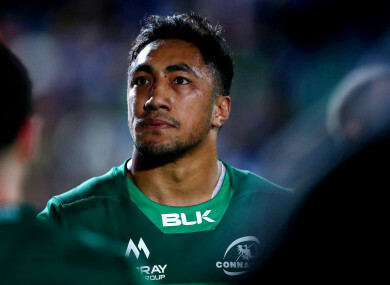 CONNACHT HAVE ONLY beaten Munster five times in the professional era but it looks like they will be without Bundee Aki as they bid to make it four wins from five home matches against their neighbours. A combination of minutes clocked up and a knock sustained against Ulster last week could see the Irish centre miss out on this key clash at the Sportsground on Saturday. Aki crossed for a try as Connacht bounced back from their heart-breaking defeat away to Leinster by putting Ulster to the sword last week. Now they are hoping to make it two festive wins from three and climbing above Muster in Conference A at a sold-out Sportsground on Saturday evening. Connacht will be still without injured full-back Tiernan O’Halloran but winger Matt Healy is back in contention and defence coach Pete Wilkins said they are in reasonably good shape heading into this one. “We are in a pretty good state overall, injury wise. Obviously the long-term guys are still plugging away in the background but in terms of everyone who fronted last week they are all available for selection. “Obviously, Bundee is someone who we have to monitor his minutes over this period, which is fair enough, and he took a little bit of a knock on the weekend so he is one who is doubtful. Long-term injuries to the likes of Craig Ronaldson, Peter Robb and Conor McKeon have prompted Connacht to bring in Stephen Fitzgerald, Tom Daly and Angus Lloyd on loan. Fitzgerald made his debut off the bench last week against Ulster but Munster coach Johann van Graan has confirmed that a condition of the loan deal means he will not face his native province this weekend. However, another former Irish U20 could make his bow for Connacht this weekend with centre Tom Daly poised to make a first appearance after his temporary move from Leinster. Wilkins said they were confident that Daly was set to go if needed and added that the loan deals make sense for all parties. “Tom Daly is ready to go and if we do give him the nod selection-wise, we would be hugely confident he can do a job for us. “These three guys who have come in on loan, they have been hugely important to us. We are very proud of our recruitment and retention strategy, it is something we work very hard with in tandem with the IRFU. “But this period we have needed pretty immediate fixes and in specific positions so to have those three guys coming on loan and fitting in seamlessly has been really important. “The fact that we had to go to the other Irish provinces to get them probably shows how cohesive the model is and the fact that we are supporting each other within the country,” added Wilkins. Email “Blow for Connacht as Aki doubtful for clash with Munster”. Feedback on “Blow for Connacht as Aki doubtful for clash with Munster”.